This three day show will encompass a series of workshops, lectures, and art exhibits all focused on PTSD and its debilitating affects on society. 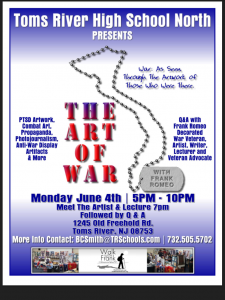 In cooperation with Toms River High School North we have set aside one night for the general public. Please join me for this award winning exhibit and lecture followed by a Q and A as I take you through the emotional history of our country using art and the spoken word. As always, my presentations are FREE to all that attend.